Usually the patching of VMware vSphere Cluster is done through vSphere Update Manager (VUM), but for this you need vCenter. In case you’re managing single ESXi host without vCenter, you might be interested to know how to patch the ESXi host from the command line. No need to say that I’m supposing that you don’t use vCenter in purpose, and so that you want to patch your ESXi 5 standalone host or that you want to patch VMware ESXi 5 Free version without VUM. Otherwise it’s much more convenient using VUM which can automate the patching process by using vMotion to move the running VMs to other hosts inside of the cluster, putting the host which you want to patch into maintenance mode and do the restart. The SSH access can be easily enabled by using the VMware vSphere client through the GUI. Via the vSphere Datastore browser upload the patch which you have downloaded from VMware Patch Website. 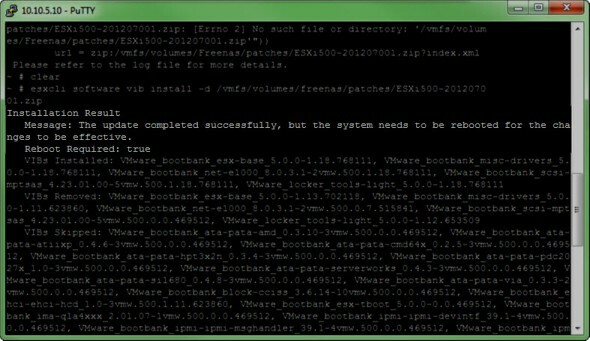 This website lists all VMware ESXi Patches. During the copy operation which can take some time, you have plenty of time to gracefully shut down all your VMs which runs at the moment on your host. I have created a sub-folder for that purpose. Putty is the most known SSH client. The process will probably take some time. You should see this screen confirming the installation and requiring the reboot of the host. You can click to enlarge. Now when you reboot, the system will probably complain that the maintenance mode hasn’t been enabled…. And you should see the version number change on your VMware ESXi 5 host. VMware vSphere 4.x did introduced virtual hardware v. 7 and VMs with 256 Gigs of RAM. 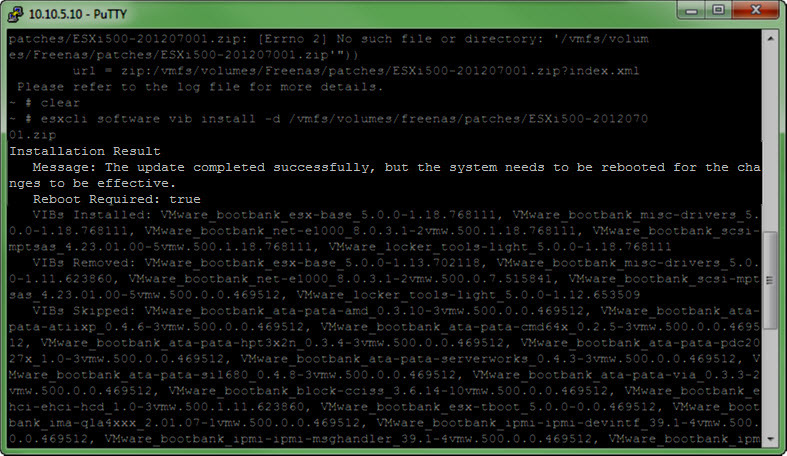 Now with VMware vSphere 5 it is possible to configure VMs with 1TB of RAM.. Those VMs are rather Monster VMs. Together with up to 32 virtual CPUs this is quite huge. Another new feature in the new Virtual hardware v 8 is the 3D graphics for Windows Aero support and run some basics 3D applications.. Cool. – Non hardware accelerated 3D graphics for Windows Aero support. ESXi 5.0 supports 3D graphics to run Windows Aero and Basic 3D applications in virtual machines. The upgrade process is pretty straight forward. 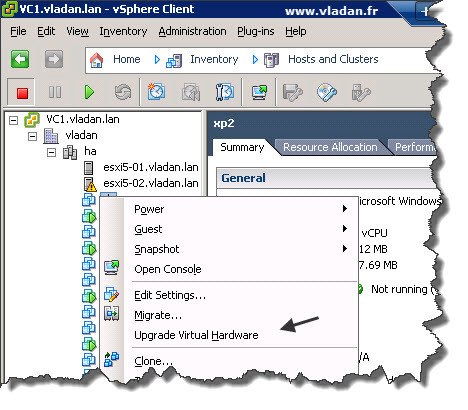 Upgrade your VM tools first, and then upgrade the Virtual Hardware to version 8. Note that there is no way to downgrade back, so If you’re not sure, make a snapshot before right-clicking that VM…. -:). And as you can see, after the upgrade the memory limit was lifted…to 1 Tb..